edited by Joan Winston as "Wynn Jones"
A BIRD IN THE HAND -- by Madelena Mumford. 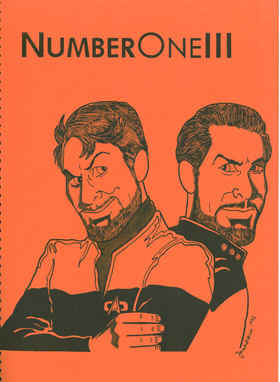 Will Riker returns to the Enterprise after months as a prisoner on Corvas Seven. What could they have done there to make him avoid any use of the transporter? Why does Ensign Ro attempt to apologize to Riker for what happened there? More importantly, why do they both volunteer to go with Picard back to Corvas Seven? Who is the demon that awaits them--especially her "flown bird." There are two women who want him--who will get the chance to clip his wings? THAT SMILE -- by Joan Winston. Short, sweet, and to the point. PROMISES TO KEEP -- by Andra Marie Mueller. Will Riker discovers what unhappiness is after Worf asks his permission to court Deanna. Guinan advises him to tell her how he feels. He does and suddenly the problem becomes Deanna's. And Worf's. What will be her decision? WHAT WENT WRONG ... ? -- by Joan Winston. You'll have to read it to see for yourself. THROUGH THE VALLEY OF DEATH -- by Joan Winston. The Cardasslans have returned Picard to the Enterprise. But he is ill, physically and emotionally, and Starfleet feels he must take the time to be cured--if possible. Jellico has been given the Enterprise permanently, and the crew is attempting to deal with his kind of captaincy. Many, including Will Riker, will not serve under such a captain. This is the story of what happens to our people when the unimaginable actually occurs. And what one officer does to change "what is" to "what should be"--even if it means the end of his career--and his life. AND THE CHANCES AFTER THAT -- by N.B. Thayer. What if, when Tom and Will went back to Nervala Four, they were both trapped on the planet? Who, if anyone, would come to rescue them elght years later? And could they live with all the changes that had happened while they were away? Could you? Artwork by D'Airo, Perron, and Rhodes. 192 pages, 8½" x 11" size, comb binding.